I was super excited and honored when Ursula from Home Made by Carmona asked me to be a part of Organize Me Pretty series. Her home and blog is so elegant and gorgeous and all of the bloggers participating in this series are amazingly talented. If you haven’t seen Ursula’s blog yet, please go and check it out! This home tour is all about how bloggers organize their home in a pretty but functional way. Who doesn’t need that kind of inspiration? Most of you know we live in a rental with restrictions (even to paint colors! ), but in the 28 months we have lived here, our home has turned into a space we love. 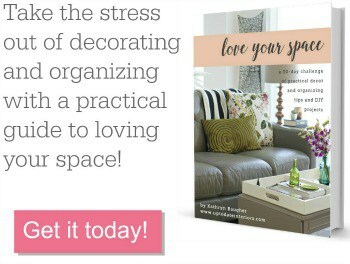 (For more of the “love your space” philosophy, click here.) I’m constantly looking for ways for organize and repurpose with what we have. Our living room is what gets used most often. It’s my piano studio. A repurposed wooden tray and candle holder organizes stickers, pencils, and flash cards. It’s my blogging “office”. The middle drawer houses my lap top and blogging planner when not in use. I also store my camera, glue gun, sewing kit, and stationary in the other drawers. Bills and other paper work are stored in a DIY file basket next to my desk. If it has to be out, it has to be pretty! Having the file basket also eliminates paper clutter since it is out and ready to use. More music is stored in our sofa table. Our kitchen is very little so I used a few containers to organize my most common kitchen items. An old wooden coke tray holds our spices. Our cake stand corrals condiments, dish soap, and measuring cups when not in use (which is most of the time!). Our every day utensils are stored in a ceramic pitcher. We have a little bathroom too. Big surprise. 😉 It has one of my most favorite organizing ideas, a wine rack for towels. I also found vintage drawer pulls to hold more jewelry next to our full length mirror and closet. Having my jewelry displayed has made a difference on how often I wear it. For more organization posts click here, here, and here. Make sure and check out the rest of the lovely ladies. This post is linked to LWSL: Thrifty Thursday! Love everything! That piano corner is so pretty and we are sofa twins! I have the same one in ivory. Love mine! lol, I spied your sofa right away! Love the styling in your living room Julia. Thanks for stopping by! Wow, my piano is littered with music books, and my cards are run amuck…I am so inspired by you! Kathy! Never in a million years would I guess that you all lived in a rental with restrictions! Your home is so lovely, stylish AND organized!! Just wonderful. Thanks for sharing!! such a gorgeous home and so well planned- i love the desk, especially! Oh my goodness theres just so much pretty in this post. I love that you’ve created such a beautiful and personal home as a renter. All the organization is just lovely and your piano is gorgeous. I love your philosophy about it having to be pretty if it has to be out! 🙂 Also, really love your jewelry organization – did you just put the drawer pulls directly into the wall? I did Mary Leigh! Just screwed them into the wall. 🙂 Thanks for the sweet comment!